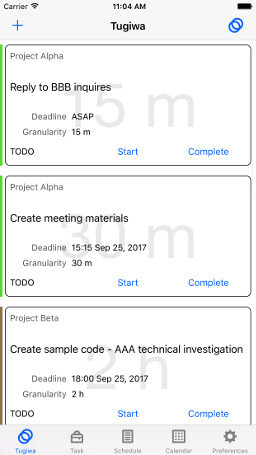 iOS application for personal task management. With Tugiwa you can display reminders and calendar data in a unified way. 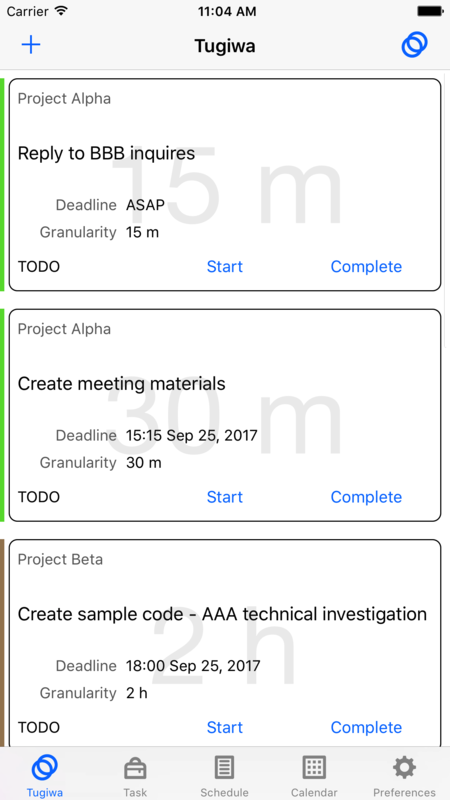 You can set granularity and deadline for reminder tasks. Tugiwa recommends the next task to be taken in considering the deadline and granularity set for each task. 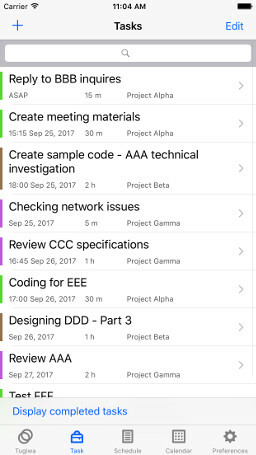 Tugiwa will automatically organize the tasks, so you can pick up the next task without thinking about anything. You can find free time between appointments. 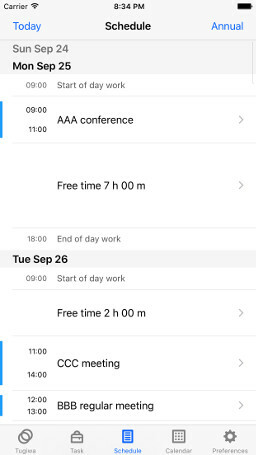 With Tugiwa you can visually display the disposable time of each week, the availability of the schedule, the degree of busyness, so it helps you to decide whether you can enter a new task. The data referred to by Tugiwa app is those of Calendar app and Reminder app, so you can use existing data as it is. 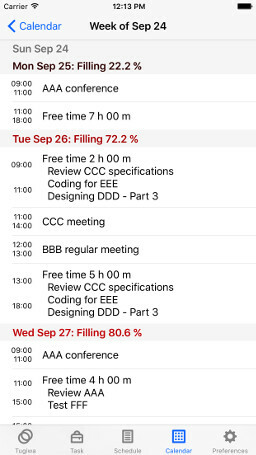 Tasks registered with Tugiwa app are saved as a reminder task, so if you have multiple iOS devices (iPhone + iPad etc.) you can share data between them via iCloud. 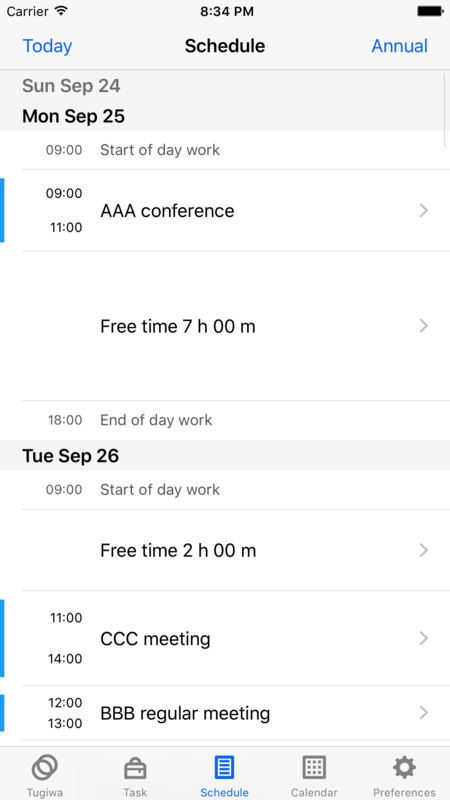 Enter events and tasks in iOS Calendar app. If you have already entered, Tugiwa app will refer to it as it is. Add a new list for Tugiwa with Reminder app. Our recommendation is to make a list for each your project. On the Preference tab of Tugiwa app, select the list of reminders to use. Enter a task with Tugiwa app. Alternatively, edit the task you entered in the list of existing reminders on Tugiwa app. At that time, enter the task deadline and granularity (how long it will take). On the Tugiwa tab of Tugiwa app, check the task to be next. On the Tugiwa tab you can see candidates for the next task to be started. 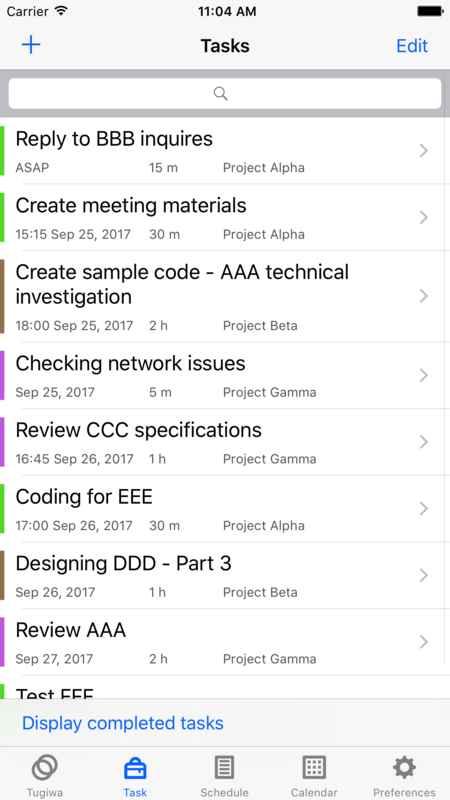 Tasks can be displayed in order of recommendation or deadline. On Task Tab you can add new tasks, delete them, search, display tasks that have been completed, and more. 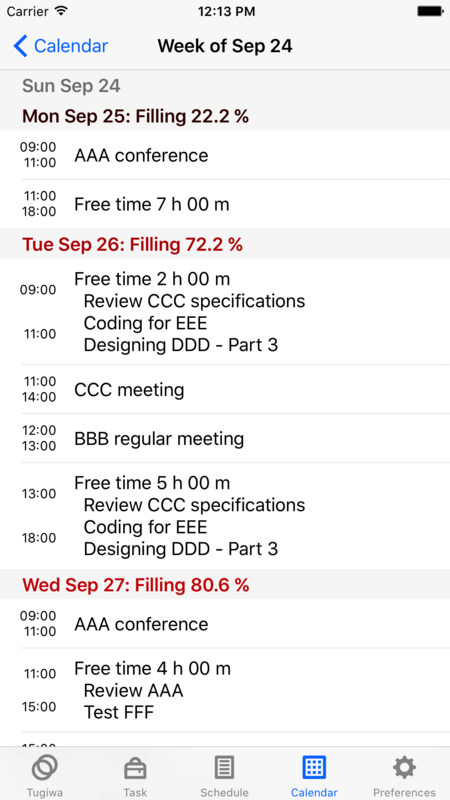 Unlike Reminder app, you can add data such as deadline and granularity when editing tasks. On this tab you can check the daily schedule. 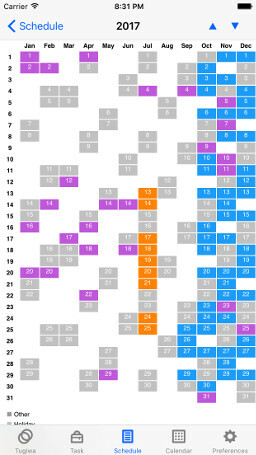 You can see the schedule of the year at single page. 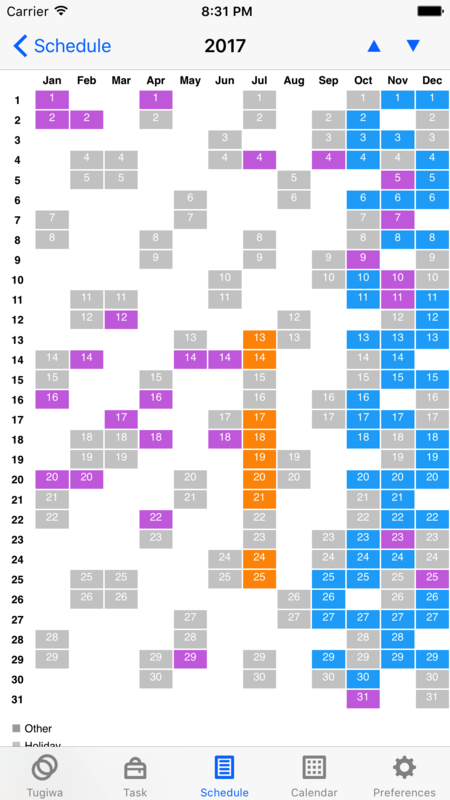 You can check the busyness of each day by the color depth. By tapping the week on Calendar Tab you can see details of how busy every day of the week is. Tugiwa app accesses reminder and calendar data through iOS. Therefore, when you first start Tugiwa app you are asked to grant permission to access reminder and calendar data. You can change this permission at any time with iOS Settings app. 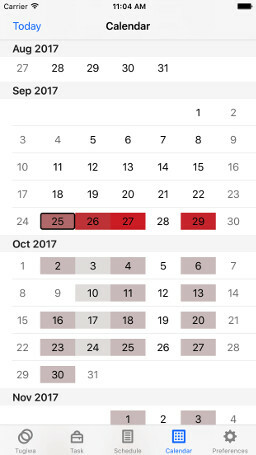 Tugiwa app uses reminder and calendar data only in Tugiwa app. As mentioned above, Tugiwa app accesses reminder and calendar data via iOS. Specifically, Tugiwa app uses the EventKit API provided by Apple. As a result, Tugiwa app accesses your data on iCloud and external calendar service such as Google Calendar. However, Tugiwa app does not do the following. For example, Tugiwa app does not transmit customer's data to external sites that you do not use, nor collect and use your data.